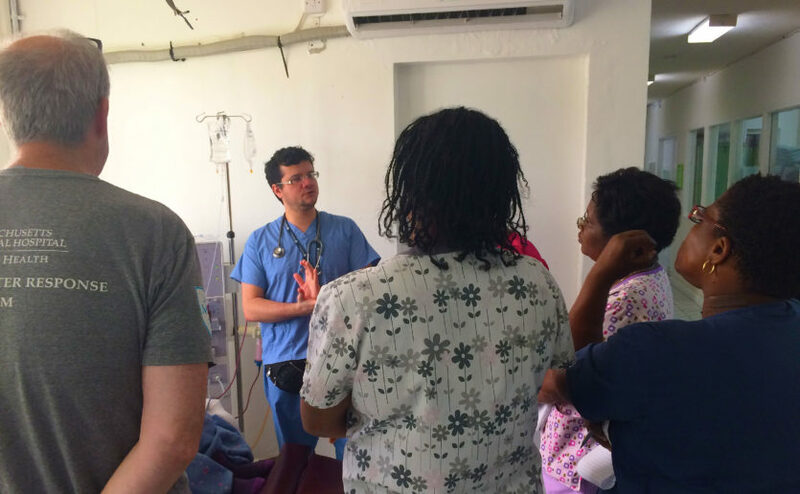 Mass General’s Global Disaster Response team leader Kevin Murphy, RN, far left, and Juan Pablo Domecq Garces, MD, meet with colleagues in the Dialysis Unit of Dominica’s Princess Margaret Hospital. In the wake of this fall’s devastating hurricanes, experienced global disaster response teams from Massachusetts General Hospital proved that they are as versatile as they are well prepared. At times, they were called upon to provide an array of medical services to people in the midst of crisis. In other cases, such as on the Caribbean island of Dominica, the assistance needed was very specific and highly specialized. Roberta Culbert-Costley, MSN, administers dialysis to a patient in Dominica. On the night of Sept. 18, 2017, Hurricane Maria slammed into the island nation of 70,000 as a devastating category 5 storm. The hurricane left more than 30 Dominica residents dead and dozens more missing. Survivors had to contend with inaccessible roads and a lack of power, communications and running water. Princess Margaret Hospital, the island’s largest, was badly damaged, with parts of its roof torn away during the storm. Maintaining dialysis treatment for Dominica residents who needed it to stay alive quickly became a concern. Regular dialysis is required to purify the blood of those with kidney disease. Kidneys can also fail in emergency situations, due to infections, dehydration and severe trauma. Mass General is an integral part of both federal and international disaster preparedness and response efforts. The Federal Emergency Management Agency (FEMA) leads responses in the United States and the United Nations coordinates them elsewhere. “The normal way we respond to these crises is we get alerted, activated and then sent with our supplies and security to the areas of our responsibility,” says Hilarie Cranmer, MD, MPH, director of Global Disaster Response in Mass General’s Center for Global Health. After a powerful series of hurricanes during the fall of 2017, more than 50 experienced disaster response professionals from Mass General and other Partners HealthCare facilities were deployed. They provided assistance in Texas, Florida and the American territories of the Virgin Islands and Puerto Rico (where some remain). “This is unheralded, the largest number of responses we’ve seen,” Dr. Cranmer says. At Mass General, kidney specialists provide care in state-of-the art facilities. After Hurricane Maria, Princess Margaret Hospital was being powered by generators and many of its supplies had blown away. Dominica team members, from left: Kim Waugh, RN, Grace Deveney, RN, MPH, Megan Rybarczyk, MD, Roberta Culbert-Costley, MSN, and Jaclyn Dulong, RN. The hospital’s medical laboratory was down when the disaster responders arrived. “But I’ve been doing dialysis for 18 years, so I had an idea about what to expect,” Ms. Culbert-Costley says. Planning and preparation determine the success of missions undertaken by the Mass General team, which often collaborates with other disaster-relief organizations. About 90 percent of relief work occurs before a team leaves Boston, with training and education preparing volunteers for the many known and unknown health and safety challenges they’ll face in the field. From every disaster, lessons are learned that will save more lives the next time. Dr. Cranmer believes that sending acute dialysis teams will now be part of the playbook. For more information about how to support Mass General’s Global Disaster Response efforts, please contact us.